Wisdom teeth are the final molars to come in, and usually erupt any time after the late teens. There are usually four – two uppers and two lowers – but some people have fewer while some have none at all. Your wisdom teeth may come through with no issues at all, but for many people, that’s not the case. 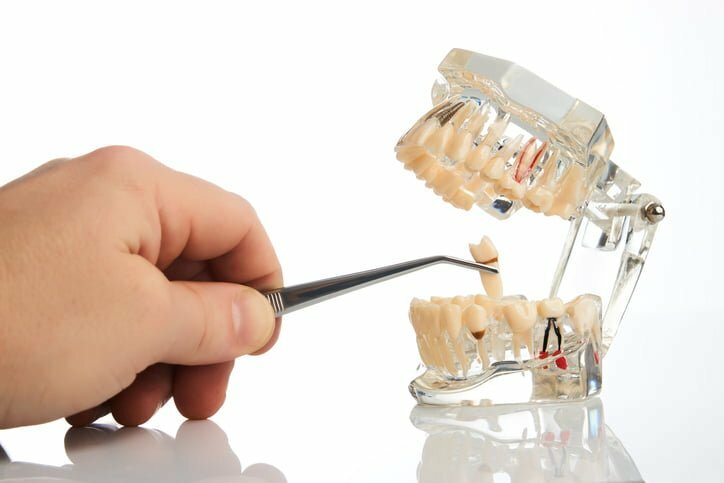 Let’s take a look at some of the issues with wisdom teeth, and what to do if you need to have them extracted. Impaction. This is when the tooth comes through crooked, pushing against adjacent teeth or into the gum. It can be painful, and make chewing difficult. If there isn’t enough room on the jaw, existing teeth can get pushed out of alignment, affecting the bite. this can also make cleaning and flossing around the teeth difficult and uncomfortable. Food and bacteria can become caught, increasing the chance of decay and gum infections. The teeth can get pushed sideways into the cheek, causing discomfort and ulcers. If your wisdom teeth are causing discomfort, they may have to be extracted by your dentist. If you do have to have them out, aftercare is critical to your recovery. These tips from the Better Health Channel can help you through the healing process. Take painkilling medications as prescribed if you are experiencing pain post surgery. Make a solution of warm salty water and hold a mouthful in your mouth for a few minutes twice a day. The warmth will be soothing, and the salt helps keep the site of the extractions clean and aids healing. Avoid foods that require a lot of chewing for a few days – soft and liquid foods are best for the first few days to avoid irritating the extraction site and causing pain. If you’re a smoker, try to avoid smoking for the first two days after smoking, as smoking can inhibit healing. If you’re a drinker, avoid alcohol for a few days – it will sting any wounds.  If you have any sign of a fever, seek medical help quickly, as you may have an infection and that will need appropriate medical attention. If you have any concerns about wisdom teeth removal, consult your dental practitioner, and don’t be afraid to ask questions. They’re there to reassure you about the procedure and guide you through the aftercare.